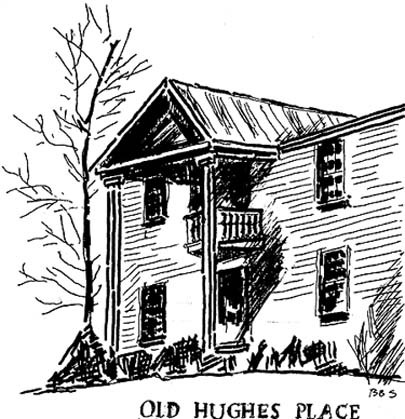 Thomas Newton and Mary Priscilla Gilliam Hughes were married about 1868 and made their home in Shelby County, acquiring property about a mile from Thomas' father Joshua, between Gratitude and Bolton College. About 1873 they moved to Dancyville to a property then known as Manbano Place. They remained there for two years and then moved back to Shelby County. In the latter part of 1879 or early 1880, Thomas Newton Hughes moved his family from Shelby County back to Dancyville to a piece of property adjacent to Mebano Place, known as Thompson Place, on which he thereafter continued to reside. Barton Schultz (1918-1997) retired to Dancyville after working and living in Shelby County. He sketched several of the older structures in Dancyville. The sketch is from the private collection of Mrs. Mary Schultz, wife of Barton. Scanned and provided to the site by Mary Kay Dancy Smith.